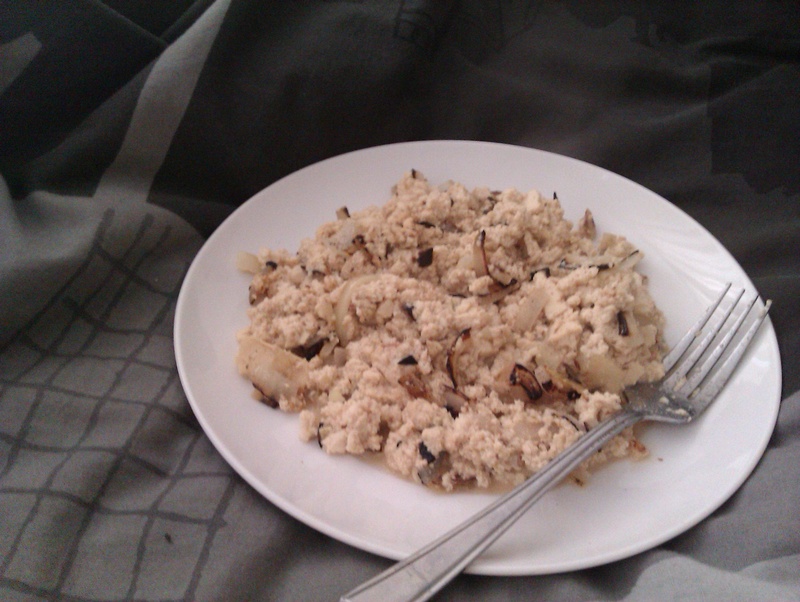 Many years ago BV (Before Vegan) I used to cook up huge platefuls of scrambled eggs with onions on Saturday mornings. We ate them with buttered toast, coffee, and orange juice. It was one of the best ways to start the day. Except it wasn’t because the way egg-laying chickens are treated is horrific. Yes, even so-called ‘free-range’ chickens. Even PV (Post Vegan) I was always a little hesitant to try scrambled tofu – even though I love tofu – because I didn’t want it to compare to those early morning, hung-over, scrambled egg breakfasts. But, I was wrong. I was wrong not to try the mighty scrambled tofu earlier than I did because it is far superior to scrambled eggs in every way. This one is not very fancy – it’s some diced and grilled onions, tofu mushed up with some soy sauce and some Tabasco, thrown through the frying pan and served, sans toast due to my laziness, with a very tiny amount of salt and pepper. And a big glass of water and a mug of green tea. P.S Make sure you buy non-GM tofu (actually, non-GM everything!). A horrific amount of soy is genetically modified – according to GMO Compass more than half of all soybeans planted worldwide are from genetically modified crops, that includes 85% of American soybeans and 98% of Argentinian soybeans. It’s not cool. There is a really good Q-and-A over at the World Health Organization about GMOs, for those interested in looking into GMOs a little bit more. It’s here. Tags: eggs, hang-over, onion, scrambled tofu, tofu, Why Vegan? Obviously, this doesn’t describe all free-range chickens – but the Pace Farm Free-Range (RSPCA certified) eggs from Safeway, those chickens look like this. The vast majority of so-called ‘free range’ chickens do. And, don’t be fooled about the ‘cage free’ certification on broiler (meat) chickens. No broiler chickens here or anywhere else are kept in cages. The point of the article is that they want to increase the number of chickens allowed in free-range classifications. These birds already live in a space the size of an A4 piece of paper. The majority of these chickens can’t reach the outdoors because they can’t reach the door. This is due to vast overcrowding, injuries, lameness, mutations, deformation and disability. Many of these chickens never, ever experience the outdoors, or anything which even closely approximates natural light. The most disturbing thing I found in that article was this: ‘Nearly two-thirds of consumers surveyed supported beak-trimming if it reduced pecking and cannibalism.’ I wonder if those two-thirds of consumers watched a beak-trimming they would still support it. Or, if they had their lips seared off with a red-hot blade whether they would think it was a good idea?!? Have a quick flip through Behind The Myth: Cage Free Eggs, and Advocacy for Animals’ The Difficult Lives and Deaths of Factory-Farmed Chickens and think about whether you still feel comfortable with the propagation of such horrific treatment of these birds. 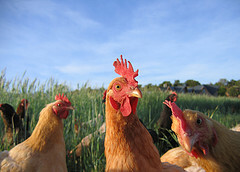 Tags: chicken, eggs, free-range, Why Vegan?